I wonder what leads other people to an interest in a particular rune type? I have always felt more of a "pull" to Futhark rather than Ogham. I avhe struggled a bit with this, as I ahve felt as if I "ought" to learn Ogham, since it is more "Celtic". However, being as I am, in Australia, the great trouble with Ogham is it's irrelevance to the types of trees indigenous here. This, I think, will finally swing me to only focussing on learning Futhark, in the end. But I do wonder - what of others who live in parts of the world where the trees of the Ogham are not indigenous? How does this affect the runes chosen? Does it affect it? if not, how does one get around it? I, too, feel more of a pull towards the futhark runes. Ogham is also of interest to me, but it is secondary. However, I don't see why you have to choose between one or the other, you can always learn both. Use what you learn through the futhark to help you proceed with the ogham. Of course, I'm still trying to learn the futhark myself, so maybe my suggestion isn't quite what you were looking for. I would just say to not limit yourself to one particular style when there are a lot of options out there. I started a little with the Ogham, but was also pulled to the Elder Futhark when I started learning about my 50% ancestry being from Denmark. So when I'm in the woods, I work with the Ogham. I replace trees that are not indigenous with ones that are, that remind me of what the corresponding tree in Europe would be. For example, we have no Yew here, but we have Canadian Yew which is a bush, not a tree. Instead of Rowan, we have Mountain Ash - but the berries and leaves are similar. Other times I work with the runes. I think it entirely appropriate for one to develop one's own local Ogham, recognizing that the historical Ogham was much different from OBOD or other modern concepts of Ogham. Look at the page: http://www.druidry.org/obod/trees/trees.html which includes one person's An Australian Ogham. I have often wanted to do an Ozark Ogham, as their are many fascinating trees and shrubs here which have a wealth of folklore about them. In fact we encourage everyone to write about trees from a personal or local perspective to help enhance this section of the OBOD site. I have asked many times, but have gotten few responses. 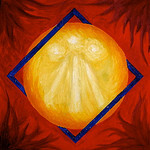 See also http://www.druidry.org/obod/druid-path/index.shtml for other resources by OBOD members. thank you - those are brilliant resources! It does help to be pointed in particular directions. I absolutely love working with the Anglo-Saxon futhorc (a sort of expanded version of the ON futhark). THe symbols practically lept into my brain with very little effort put towards memorization on my part. My brain is just wired for it I guess! The ogham on the other hand, well...I've always had an intellectual interest in it, but frankly, I just can't keep the darn things straight. Mostly I think this has to do with my inability to 1) count and 2) perceive changes in directional orientation. Between those two things, the ogham all ends up looking the same to me, no matter how hard I try to sort it out. Hopefully someday I'll be able to master it, but for now, I'll just hang out with ol' One-Eye's script. I don't even know if you still care...but...furthark and ogham. Well, the futhark is Scandinavian. I have learned it and used it for divination but I might be 'rusty' on that at this point. The Ogham. I grew up in North America and wasn't exposed to even knowledge of the Ogham until I was over 25 years old anyways and maybe older. I live up in the North. Right now I live in Europe but for the last 10 years I lived in North America - in a region other than the one in which I originated. Most of the trees listed in the ogham that came with the Ovate course do live around here, where I live...I mean, the people who made up the ogham in the first place just used the trees that lived around there. If you are down under, so to speak, I'd recommend working with the ones that you do have there and maybe confer with your tutor about what else you can do. You may be able to make substitutions: you will end up either inventing or making an academic exercise out of something real if you have only half the ogham in the trees where you live. That's what I actually think. I have settled on the the first 24 letters of the Anglo Saxon Futhorc - which correspond with the Elder Futhark, and excluding the additional more recent runes that are at the end in the Anglo-Saxon Rune Poem. They sit comfortably with me and I am finding they are sticking quite quickly. Also, I find they are developing many layers of meaning for me now. I always felt very connected to the Futhark, being a German of Germanic descent mostly. When I first encountered them as a teenager, the runes felt like old friends to me. I never had the same feeling with Ogham and also have trouble learning signs that often differ only by the number of "branches", as I am pretty bad with numbers. I like the tree connection though and all the trees can be found in Germany as well. Ogham and Runes are certainly very closely related. The runes are called 'Viking Ogam' in the medieval source material. There also have many other parallels eg similar symbols eg nyd and muin are identical, similar sounds and similar name meanings. Also cryptic runes can appear identical to ogam and the ogam permutations have many symbols identical to runes. Both where used by poets-skalds and the Filid. Ogma and Odin also have much in common. I think in ways these systems can each shed much light on the other. I was immediately attracted to the Futhark myself. I started using them about two years ago; signing all my tools with them etc. My intent was to find out from experience if they hold any "magical" powers as sometimes claimed. In my experience -- not saying it is the same belief for others -- they drew out the giants; white people who lived in the south west about 9000 or more years ago. There is proof of this in the mummy's that where found in Manti UT. in 1973, http://greaterancestors.com/?page_id=1565 I've found better websites than this but can't locate it tonight, sorry. (this is just to show they did exist) Anyway my point is I carved these runes into stone in two places coupled with another glyph (which I'll keep privet) making a triangle. I set it (the triangle) to just cross my tent on the north side by about 2-3 inches. This was a test of sorts into the occult paranormal. Note: I've seen spirits my whole life. What happened was very interesting. Some very strange beings/entities showed up periodically, kinds I've never encountered before. Then just after leaving the mountain location after camping alone for 3 months I used the runes again by writing them on my bedroom windows. Then, the giants started to show up, they introduced them selves as friends and offered me protection. Very strange I know. I still use runes to this day and I'm a firm believer in their use as a magical medium. I just wanted to share my experiences of using these runes with you all. If it benefits anyone it will have been worth it. As the atavistic-adamantine, I bring forth the quintessential and irrevocable predication of sublime intervention toward the dissemination of the pernicious class that has inseminated itself upon the spiritual, to irrevocably bring it to inevitable end. I use the futhark, and I've mostly used bindrunes when needed. The aegirshjalmur is a very strong protecting bind rune. I always pick up small white pocket sized quartzes on my walks, and I paint them with the runes or signs that I need. I charge them before I use them. I have good experiences with protecting places, other persons and myself. illion, thank you for sharing this its been insightful for me. I've been very successful using runes, although I feel I have much to learn about them. Can you please explain what you mean by "charging them"; how is this best accomplished. I would like to better use them in blessings and protection. I will share some of my experiences so that you may know my intent. I state the fallowing only as a reiteration of my experiences based on my beliefs. I respect the fact the you and others may feel differently than I about these things. The runes, in the little I know about them have been powerful in their ability to protect, both myself and also locations that I've carved them into stone. In these areas -- coupled with other things I do -- has put many restless spirits to rest and has assisted in bringing some to peace from a state of being unsettled (I don't understand why this works beyond my experiences of it). I would like to learn more if you are willing to share, or point to sources that I may learn. May love always find you. I visualize the stem as a persons spine, and the bindrune flows as energy through the person's body and light-body and out of the person's aura, so that the outer forks of the aegirshjalmur f.ex will be a barrier that only let friendly impact get through. When I want to protect a place, I visualize the stem as a pole in the place's centre, the forks reaching out of a circle that I have defined to be protected. The talisman will be thrown somewhere inside the circle after I have charged them, and I always try to find a place that people won't find it if possible. When I protect persons, I give it to them and make them carry it and take care of it the best they can. When the painting has worn off, or they lose it or get separated from it, they probably don't need it anymore. I've never had to do this over again for anybody/anyplace, but I think that this kind of magic will fade away over time, and that there probably would be some rare situations that would need this magic to be done over again to strenghten it. I guess it all depends on the power of the resistance. I would really like to read what you would like to share about this topic, it is so interesting. I'd only recently heard of using the Ogham as a divination similar to the Futhark, however I've not found very much as to the meanings of each rune. There are a few sites that list the trees associated with the letters, is the meaning of the rune then pulled from the tree meaning? Unfortunately the links that Kernos provided don't seem to work anymore, a victim of the site revamp perhaps? illion, thank you for sharing all that you have. I'll let it sink in and adapt it to my own intuitiveness (my natural knowing). I would be more than glad to share what I can, it may not be much since, like you, it just comes natural to me I can't say I really understand any of it for sure. I feel "We" those like most of us here are setting a foundation of knowledge based on what we can make of myth, lore and legend's that are influencing our instinct's allowing us to believe in them. through this I feel we are giving to those who will fallow us generationally the chance to fully grasp its greater meanings. Its like the Native American philosophy of living for the 7th generation... we don't own anything -- we barrow it from our grandchildren. That is my philosophical approach to this process. What we are doing by learning all this is making it better for our children so they can take from us, couple it with their intuitions and be far greater than us in its knowledge... as it should be. I share only from my own experiences with the intent of hopefully inspiring others so they may become the greatness that they already are. When I set up runes and work with the spirits I know I cannot have any fear or negative thought's these will alter the effect's I mean to create. I settle in peace and love knowing that I am all things i.e. I am the spirits the trees, birds, animals, insects, microbial's, the earth the sun and even the galaxy with all its myriad things. Some unsettled spirits have thanked me for the work I've done. I couple the runes with other glyph's if my instinct tells me I should. these include but are not limited to the planetary symbols, pentagons, heptagon's, decagons and dodecagon's primarily. I feel my intent is important but not really critical because, when I started using them it was experimental and I had no specific intent and still found results. But I believe that intent makes the process more powerful. I feel in myself I need to be careful with this cause carving them 1/2 inch into stone is very long lasting; they don't wear out as fast as yours do. When I put them on my windows and the giants showed up it was not just the runes and geometry that influenced them, it had to do with me calling them when I went through a 12 hour long process in Alaska about 7 years ago to meet all my ancestors back as far as I could go. This process is dificult to explain so I'll leave it at that. They offered their protection and have done just that... they struck down things that where trying to invade my dreams with malicious intent. they also assisted me in meeting the earth mother herself a very strange experience that I can't even explain to someone in person let alone here. I haven't even used the runes in that many differing variations... I guess my intuition knows more than I do. Anyway I hope this answers you well and assists those who read it. May the rays of the sun warm your soul and brighten your day's. Thank you so much for sharing, Curcumambulation. I follow you on this. I have been in need of using runes and/ or other symbols in an acute situation. Then I have "placed" the symbol or rune with my mind's eye where I needed them. I have used a viking ship to protect myself when travelling on icy roads in car, and it works in the same way as the runes. I place the ship in front of the car and it leads me safely through the dangerous distance. I think the intent is important, but using these old symbols that has been used through generations before us makes them strong in themselves, and I believe there is a god or godess that reply and assist us in working with these mighty energetic marks. I guess it works on its own and gets stronger with a strong will and intention. I also think that carving is a lot more lasting than painting, and I have never dared to do it with stone. I see protection magic as a "safe" kind of magic because you don't hurt or attack anyone, you just build up a defense so that others can't attack, but I never use it "just in case". It is always the last resort, when things get bad, and you find yourself in a very difficult and maybe dangerous situation. To carve in tree is easier to do. It lasts longer than to paint on a stone, but you can burn it if you need to redo the magical workings. It will rot after some time if you don't do anything about it. A carved stone lasts forever, and I have a great respect for that. I don't think that it is healthy to close the door for all negativity that goes your way, because we need the dark side to develop ourselves, grow and get stronger. What you say is fascinating -- I have learned allot from your sharing. Mental projections ( that which you cast with your 'minds eye) to me can be more real than the physical. Thank you for this link "Kveldulf Gundarsson: http://www.orakels.org/media/occult/Run ... _Magic.pdf " I will end up studying this -- in all its facets -- for a few years i'm sure. I do have to admit I'm not sure that its the runes that cause my experiences, or the planetary symbols themselves. I must ask if it is not our own individual belief that propel these forces to act as much if not more than symbols and glyph's. I feel our belief is the the most powerful force in nature. I hold for you that your belief in casting from your hearts-mind (the part of your mind that is in union with your heart) become so powerful that your Viking ship will cast literal shadows upon the ground and that you and your family have every protection from it you deserve. Just one question, do you think it possible that these giants I've been meeting might be somehow connected to these ancient Norse Gods? I hadn't thought of this before our conversation...now it leaves me wondering. The giants are entities that appear in many old cultures, not just the norse, so I can't be sure to say to you that they probably has a connection to the norse gods, but there is a strong possibility that they do, since you have been working with the runes as you've met them. In norse mythology the giants are dangerous. Thor with the hammer fights them all the time, protecting the humans and the gods from them. They are the personifications of chaos and wilderness. They live outside of the farm and needs to be controlled to be of use. The ases and the vanes are order. Anyway, the giants are not just bad, because they are the material that shapes our world. They can be of great use. Our world, the land that we thread is the body of a dead giant. I see them as the raw material that we all are made of, and if we are to create something new we are to use the giants, shape and control them into something we need. Some of our gods and godesses are said to be descendants from the giants, very often from their mother's side, some of them has giant women as their lovers and have children with them. Odin created our world with a giant, Thor protects us from new giants to come and destroy and change the perfect world that we live in, the world where humans can live. Gods/godesses need humans, humans need their gods/ godesses. As I see your giants from my norse point of view, they are potentials to create something new, but you should be careful, because if your giants get out of control they can destroy more than they are of benefit. No matter what, the old fundament will change and get shaped into something new. These are of course just my thoughts, and you might not think that they ring true for you.